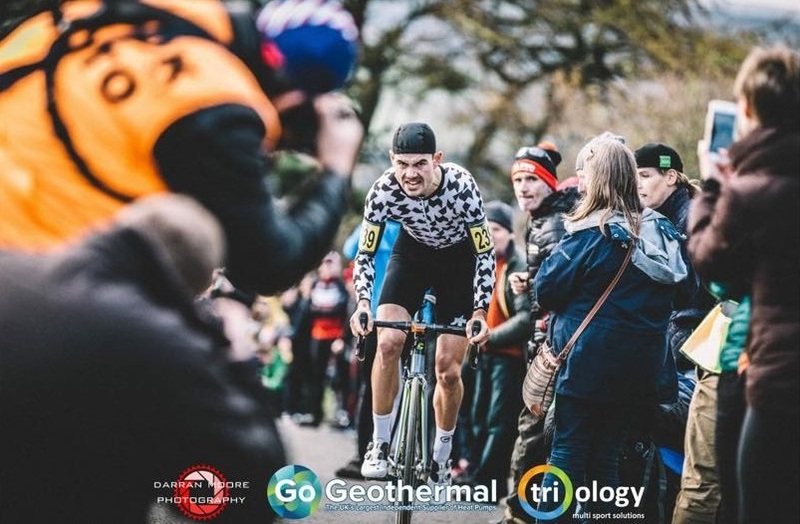 CTT National Hill Climb Championships | theraceforthecafe.com . Riding up a hill fast in Northumberland - not me obviously I was just watching! 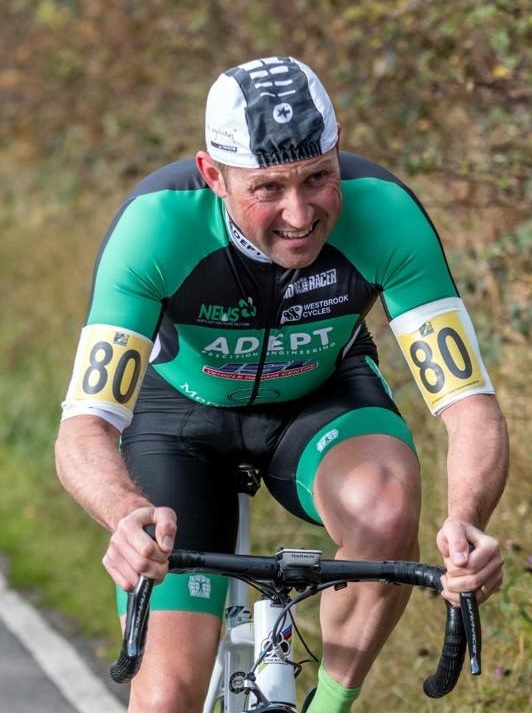 This year's CTT National Hill Climb Championships was held at Hedley on the Hill in Northumberland and promoted by an enthusiastic team from local club G S Metro led by Ben Lane (below) and what an excellent job they did of organising this prestigous event. It was my first experience of spectating at a hill climb and it turned out to be terrfiic day out. Arriving at Hedley on the Hill there was ample car parking in a field at the top of the hill for £1 - can't argue with that. There was also a pop-up cafe with seating which was doing a good trade also with very reasonable prices. From the car park it was two minutes walk to the finish of the climb then a slow wander down the hill to find a good spot to watch the action. An enthusiastic crowd lined the entire course and it seemed like every club in the region was represented. Lots of spectators were in fancy dress and the support for the riders was incredible with people blowing whistles, horns and even handlebars, ringing cow bells, or banging on anything that would make a noise from wocks to bike wheels. Event organiser Ben Lane above of GS Metro and his team had a big job on their hands promoting the event with over 240 riders on the start sheet. 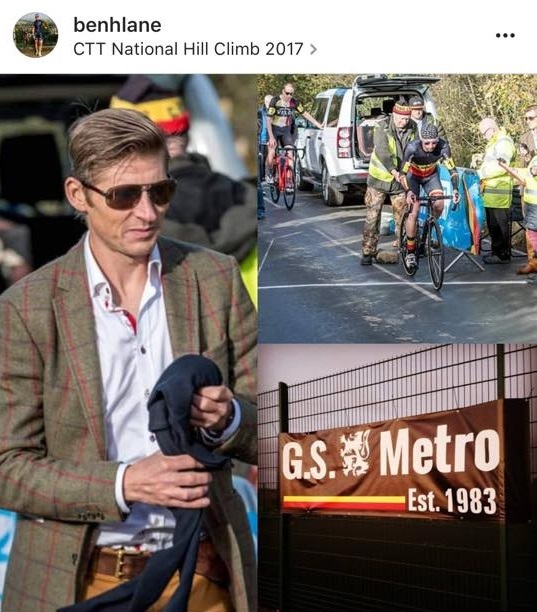 Organisation of the championships was fantastic and all the riders and spectators that I spoke to on the day and since have been full of praise for Ben and his team from G S Metro. Above Craig Berry of the promoting club gets the event underway as first rider off posting a respectable 5.44. 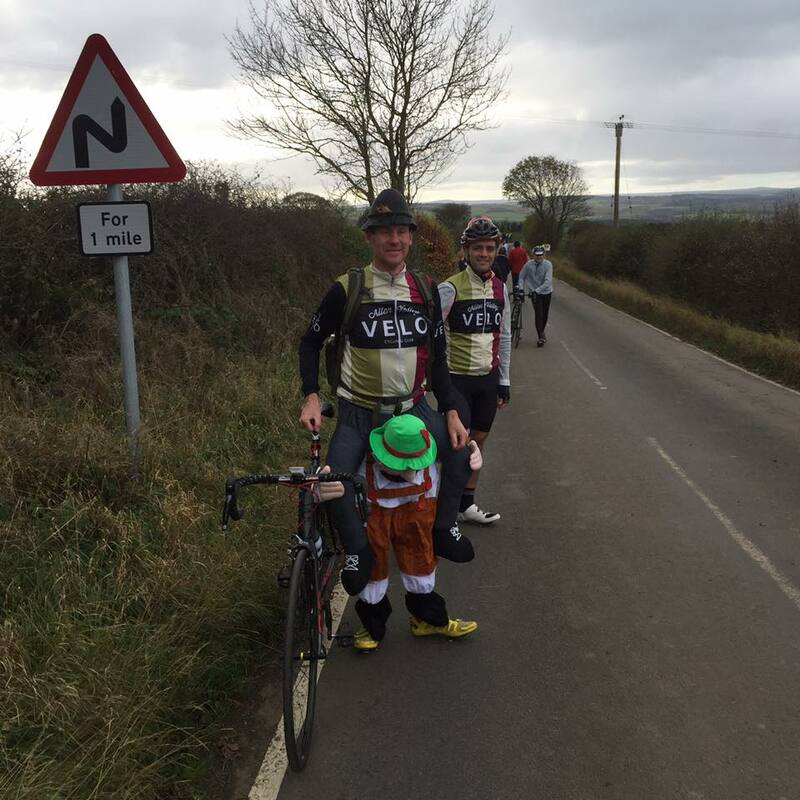 Allen Valley Velo adding some colour to the event, not sure if he rode home in his costume? This picture was taken near the finish of the climb which was probably just about the perfect type of hill for the competion with a a few turns and a really steep bit in the middle and long enough to make it around a five or six minute effort for many of the competitors. Also and crucially the course was completely closed to traffic thanks to the efforts of organising club GS Metro and having plenty of marshalls in place allowed the spectators to actually stand on the road without impeding the riders. My friend and training partner Hannah Farran heading for a 6.02 in the colours of the Edco Continental team who for next season will be Boompods Edco Velo8. VeloUK/NEWS The national champs was the final event in Hannah's hill climb 'season' having gone straight in to an eight race hill climb campaign on the back of a full season racing on the road, a tough way to end your year that's for sure. 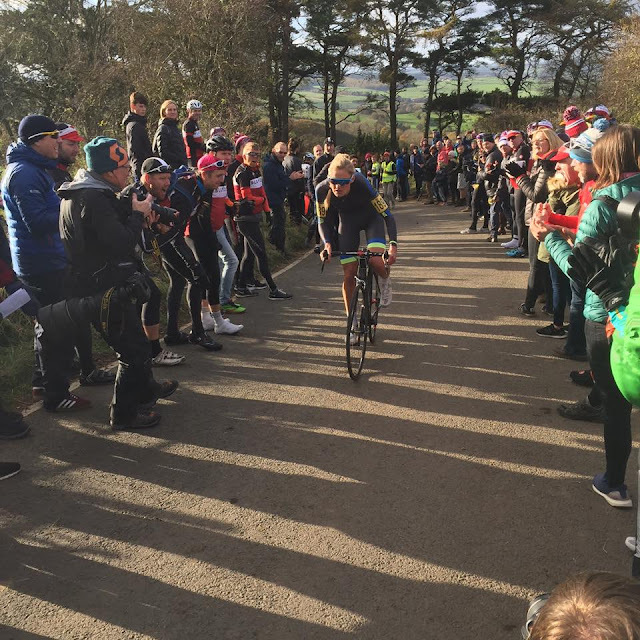 There was a very strong field of forty five female competitors on the day but while doing a bit of reading before writing this post I was a bit surprised to discover that the CTT National Hill Climb was only opened up to female competitors as recently as 1998 and the first women's championship wasn't awarded until 2003. If that wasn't bad enough there were no second and third place prizes awarded until 2012 ! hard to believe, but true. 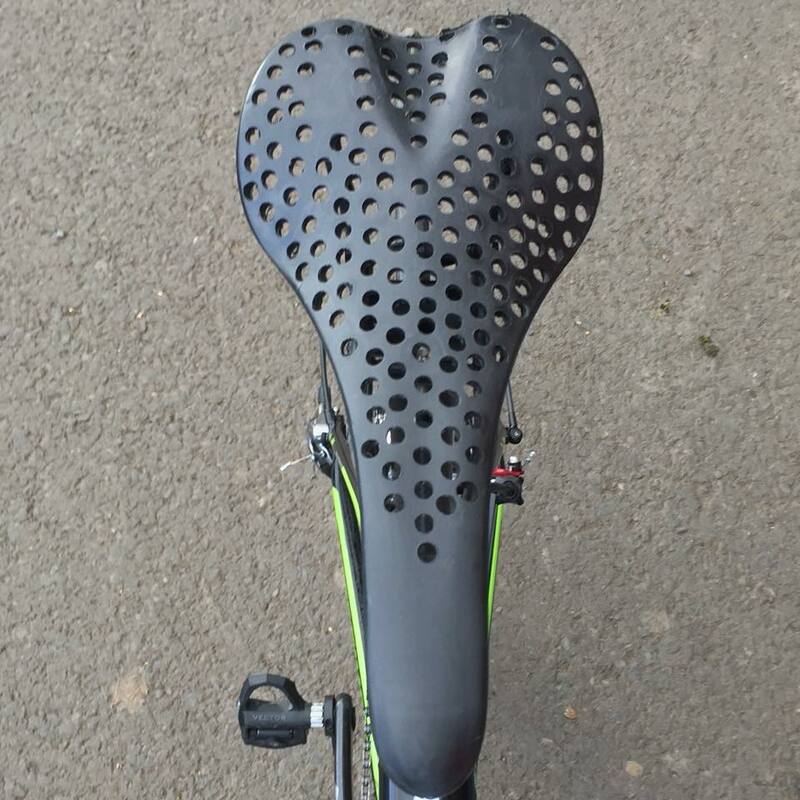 I have previously written about influence of technology on cycling here Technological Fetishism and here Are you a prisoner of Strava? but the hill climb as a race seems like a bit of a throwback to another time in this age of technology. It is a very simple event, start at the bottom of the hill and ride to the top as fast as you can, fastest time wins, mind you I would be surprised if most of the rides didn't end up on Strava before the end of the day. Above - roared on by the hugely enthusiastic north east crowd Joscelin Lowden the 2017 Ladies Champion who clocked a blistering 4.53 on the 1.1 mile course to take the title. 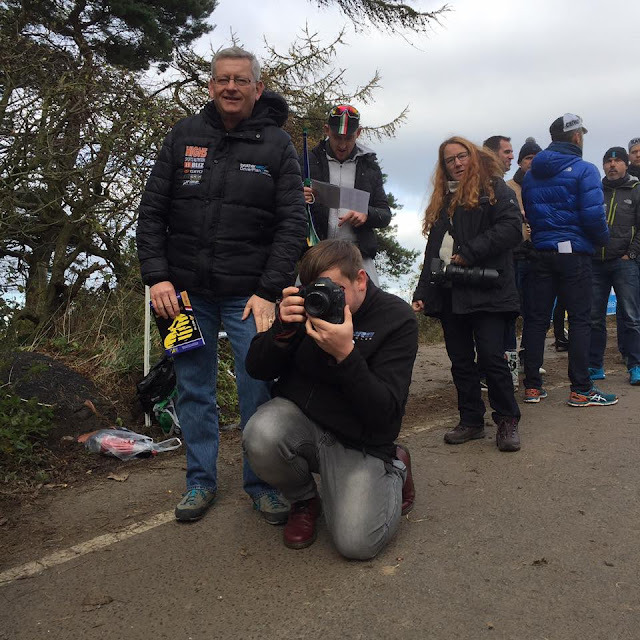 Not just loads of my north east cycling friends to catch up with at the hill climb but also a really good turn out of some of my cycling photographer friends who were capturing the action and enjoying the event. Above two of my team mates from Ribble Pro Cycling our team photographer Dean Reeve along with DS John Reeve. 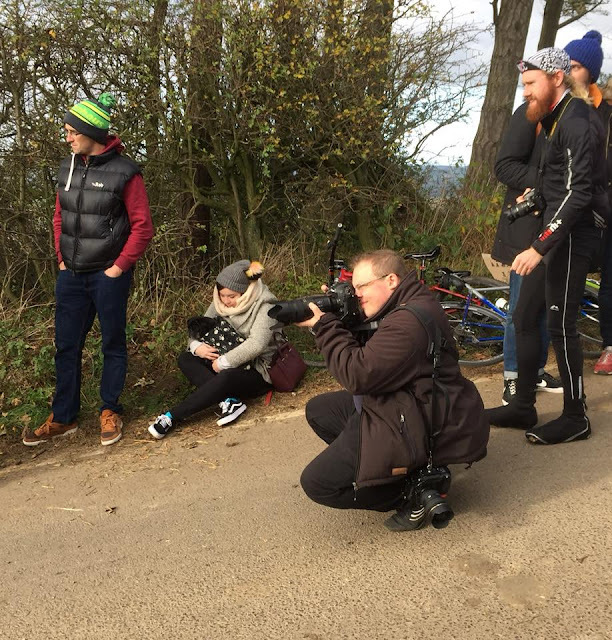 Also in this shot on the right is Ellen Isherwood another well known and talented cycling photographer and also a friend of the team. Follow this link Ellen Isherwood to see a great gallery of Ellen's images from the event. Possibly because the nature of the hill and that the spectators were really close to the action or maybe just because this is what hill climbs are always like? It was that sort of event where you were so close to the competitors it almost felt as if everyone present was part of the championships. 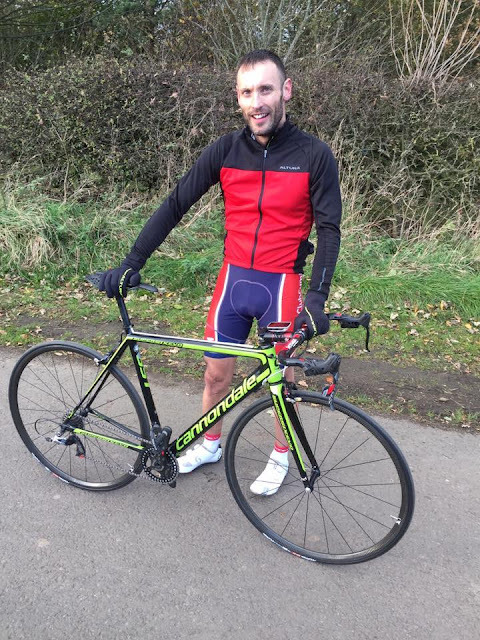 At the top of the hill I got the chance to chat with hill climb specialist Niall Patterson of Velo Club Cumbria who had just posted a super fast 4.20 on his heavily modified Cannnondale. Some precision Black and Decker work on the saddle and chain ring on Niall's HC machine. Not sure how much weight Niall has saved with his modifications but he is not finished yet as he told me that next year he plans to strip the paint of the frame too. Just in case you are thinking: wouldn't he be better just loosing a bit of weight ? from what I could see there wasn't much more scope to do that, Niall looked lean to me - very lean. 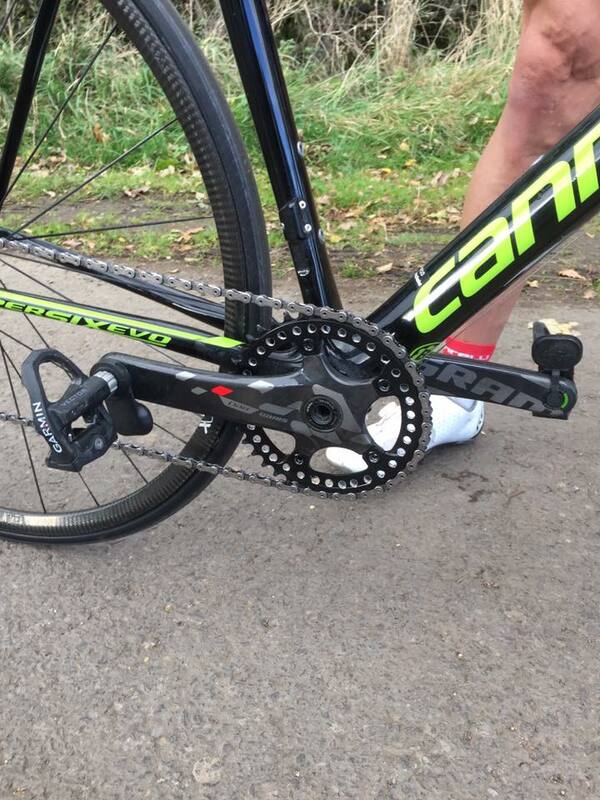 The hill climb might be a simple event but the impact of technology is still evident on Niall's bike. Garmin Vector pedals are surely not the lightest option, but having his power data available during his effort was clearly a compromise that even a serious competitor like Niall was happy to make. Above another one of my friends and former team mate Shaun Tyson of Adept Precision RT. Shaun clocked a 4.53 in the male vet category and after his ride he did what a lot of the other competitors seemed to do, stayed around to spectate and cheer on the other riders. 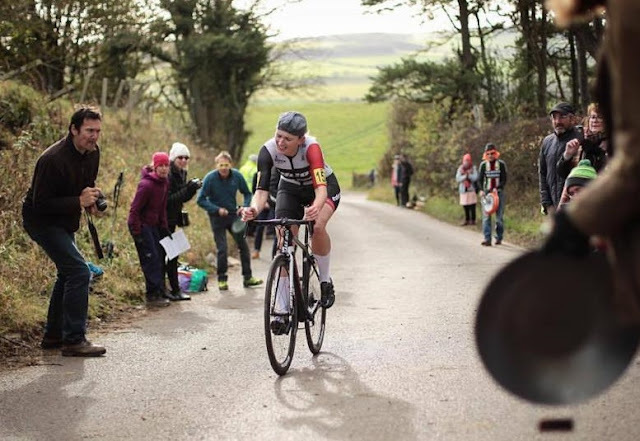 Shaun is not just quick up a hill, he regularly gets on the podium in time trials, crits, road races and even in the odd mountain bike endurance race. Final picture for this week is appropriately of the 2017 National Hill Climb Champion Dan Evans of Assos Equipe UK on his way to winning the event in 3.54 and knocking 15 seconds off the course record in the process. Great image by another north east cycling photographer Darran Moore really capturing the fantastic atmosphere on what wasn't just a cracking day out at Hedley on the Hill but also a great advert for north east cycling.